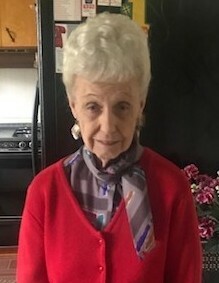 Mary Ann Augg, 92, of Lancaster, passed away on Saturday, April 13, 2019, at her home. She was born December 19, 1926, in Canal Winchester, to the late Lloyd and Blanch Taylor. She was a member of Calvary Lutheran Church in Lancaster. She enjoyed traveling with her husband, gardening, and dancing. She is survived by her grandchildren, Brian Daniel Augg of Dallas, Texas and Sherry Ann (Michael) Augg-Bigler of San Antonio, Texas; great grandchild, Jesse Brian Castro of San Antonio, Texas; sisters, Virginia Paskins and Linda Dotson; and several nieces and nephews. She was preceded in death by her parents; husband of 74 years, Chief F.E. “Danny” Augg; son, Brian Eugene Augg; and brothers, Eddie Taylor and Leon Taylor. Funeral service will be held at 1:00 PM Monday at the FRANK E. SMITH FUNERAL HOME, Lancaster with Reverend Diana K. Gugel officiating. Burial will follow in Maple Grove Cemetery, Lancaster. Family and friends may visit from 11:00 am to 1:00 pm Monday at the funeral home. Donations may be made to the Shriners Hospitals for Children - Burn Unit, 3229 Burnet Ave, Cincinnati, OH 45229 or FairHoPe Hospice, 282 Sells Rd, Lancaster, Ohio 43130. There's still time to send flowers to the Funeral Service at the Frank E. Smith Funeral Home at 1:00 PM on April 22, 2019.